Nice card Larry! - I think you got a good deal. RC in that condition for one of the all-time greats - I doubt that price would be possible on the baseball side of the hobby. Thanks guys always fun to find that last card! I've been chasing that Nitschke on Ebay for awhile, it's not a rare card, but I guess it's popular among collectors For a price guide, I use the 2012 "Standard Catalog of Vintage Football" and it values this card at $80 in NM condition. I was looking for a "collector grade" example for about 20% of book and I think this dealers price was fair. Let me see if I have doubles of any of these cards, Larry. Not sure if I do but will check for you. What price point are you looking at for these if in collectors grade? Just picked up some more 1950 Bowman's. The Rote is a proof, which is pretty unique. Larry that's pretty crazy Nitschke had already played for 6 years before he got his first card. That would have been great if he had made the 57 set with all of the other rookies. Clint: The standard catalog calls it his RC. Although "1st Topps card" might be a more accurate description I know about all the rookies in the 1957 Toops set, and I need two of them to complete my set #119 Starr and #151 Hornung. 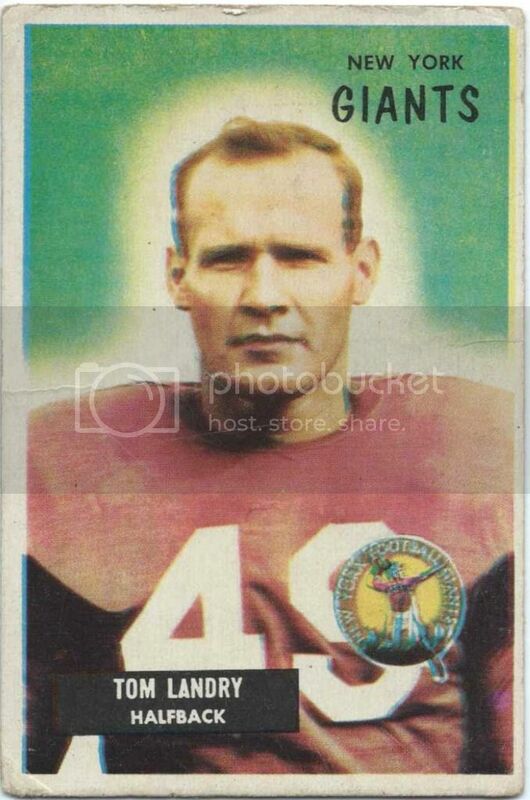 Nearmint is showing a pre-rookie Nitschke - 61 Packers Lake to Lake. It seems so common for even star defensive players and OL to have their first major card several years later, I don't think about it that much anymore - lots of examples. Probably doesn't help that the football sets always seem to be relatively smaller the their baseball counterparts. Last edited by TanksAndSpartans; 04-05-2015 at 08:10 PM. And that Lake to Lake Nitschke is pretty tough to get! Way to go Lucky Larry. Would like to build that set one day. Last edited by sockwell123; 04-06-2015 at 05:51 PM. These two cards arrived today via an ebay purchase. I bought a 1935 Goudy baseball card from the seller, and as we often do, after we win a card we take a look to see what else they might have to offer. 1952 Bowman small #1 and #2 cards in the set. 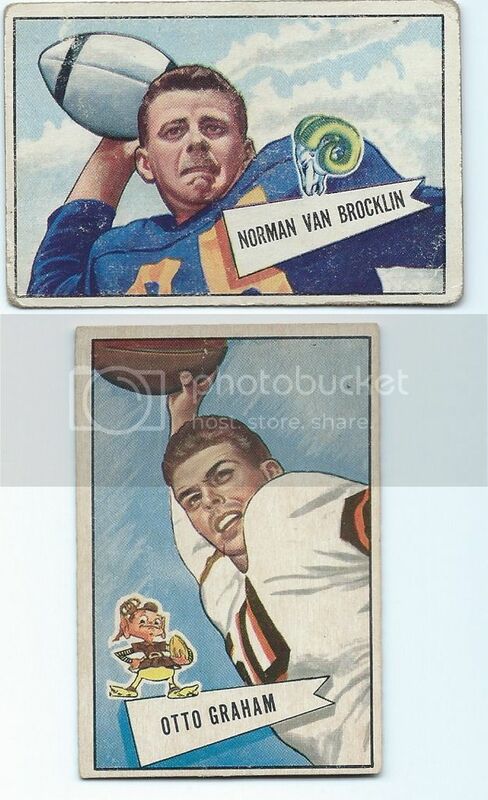 The seller had them listed "buy it now, or make an offer" so I made an offer The Van Brocklin in collector grade cost me $25 of course being the #1 card in the set adds a premium. 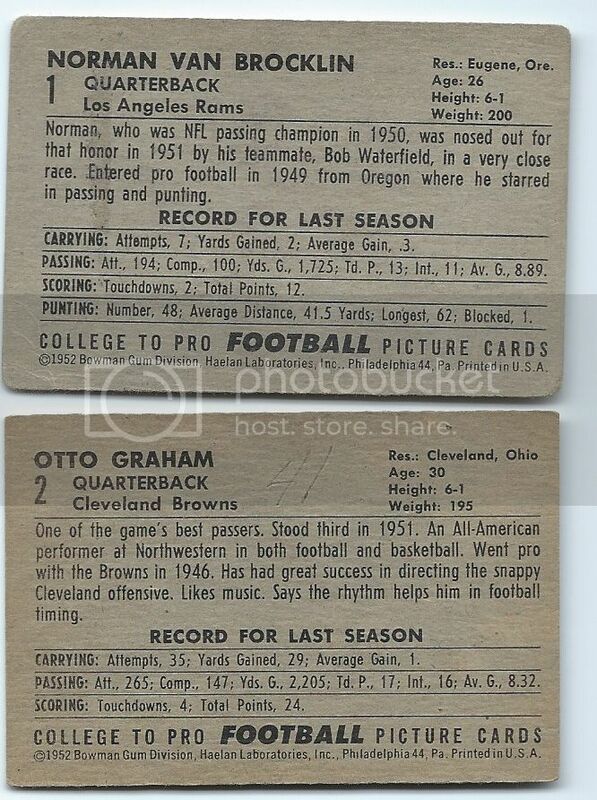 The Otto Graham again in collector grade dealer accepted my offer of $18. Real glad to knock these off my list! I don't know anything about this card, other than what it was advertised as. 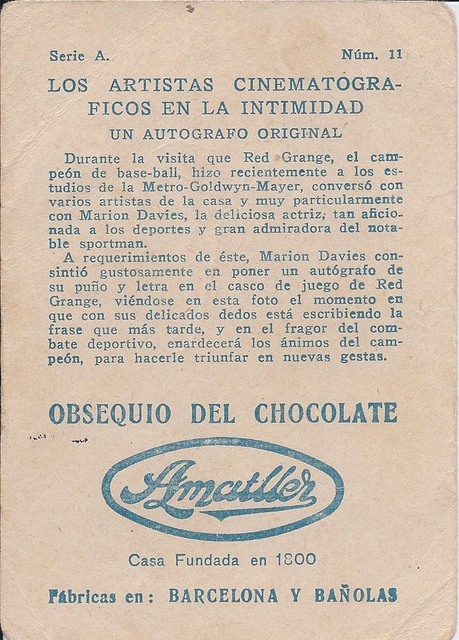 It was advertised as a 1932 Sanella Margerine Rugby card. It was only a few dollars, so I thought what the heck!. It sure looks more like American football rather than Rugby however. Even though it's probably just a generic illustration, I love the colors. It's about the size of the larger size Topps and Bowman cards of the 50's, but on thin card stock. Interesting! I agree - the brown pants, vertical striped jerseys, and helmets all look like football in the 30s. Also, the brown ball (Rugby is a white ball at least in modern times). Another giveaway would be blocking. You can't block in Rugby and it could be argued that it looks like some blocking occurred. 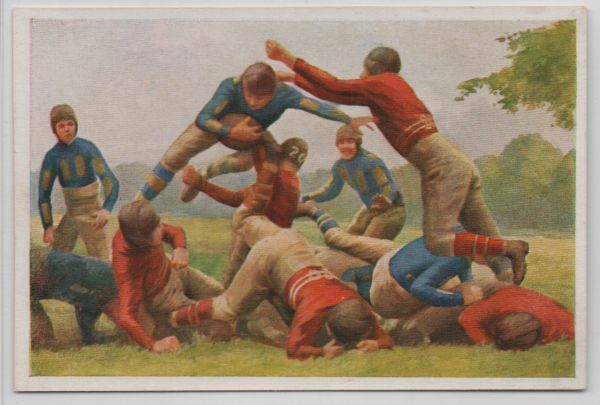 I do see "Rugby" on the back of the card though and given that our football isn't popular in any other country even in 2015 makes it seem more likely to be Rugby than American football. Anyone know what language that is? Last edited by TanksAndSpartans; 04-17-2015 at 08:31 PM. 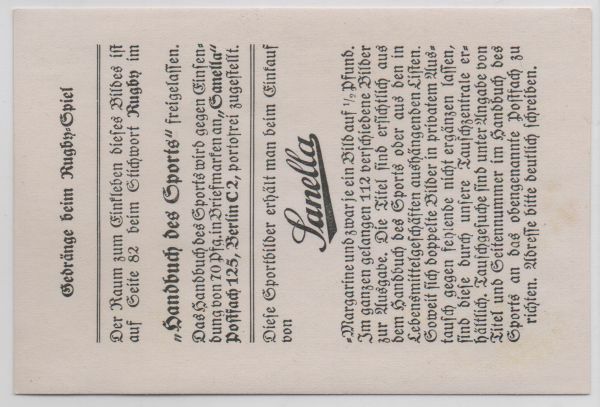 I believe these cards are from Germany, but I cannot read German. That is definitely American Football. A lot of sports sets show sports from around the world and often don't classify the players or sports they depict correctly. Here's a Spanish Grange card that says on the back he plays baseball. I have a foreign card that depicts Jim Thorpe and calls him "Jom Thorpe" as well. Not a card, but a pretty neat 16" x 20" photo when Case permanently took possession of the Ohio Cup in 1908. Last edited by Angyale; 04-20-2015 at 05:05 PM. This 1961 Fleer card arrived this morning via ebay purchase. Cost the opening bid $4.99 plus some shipping. Despite the paper loss on the front I consider it a beauty and welcomed addition to my set, just six more to go! way to go. How many cards are in that set? Last edited by sockwell123; 04-22-2015 at 11:27 PM. Last edited by sockwell123; 04-23-2015 at 07:40 PM. Another great B/S/T transaction. Thanks Ray! Down to 5 for the set. Nice to see another Chicle collector. Which 5 do you need? Down to Hinkle, Isola, Tosi, Johnston and of course the big one - Nagurski. Last edited by KrenBats; 04-28-2015 at 01:57 PM. 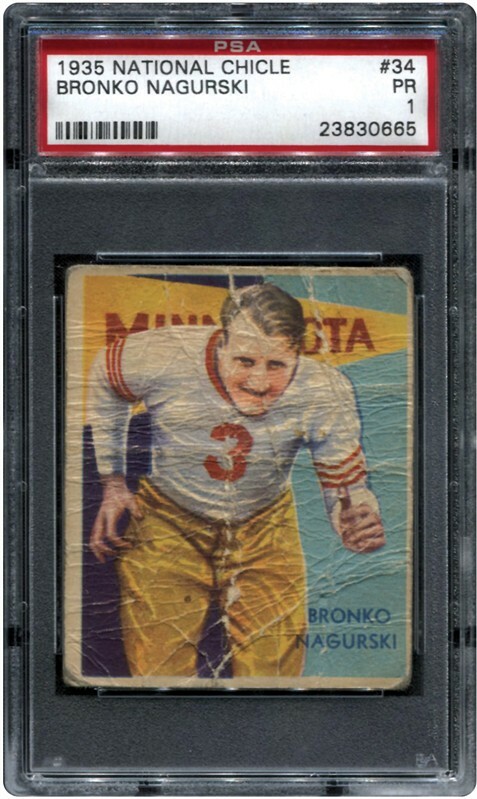 Cool - I feel like a lot of Nagurski cards have been coming around recently - every auction seems to have one, no cheap ones though . I also need Hinkle and Isola as well as Clark, Montgomery, Kelly, Burnett, and Ernie Smith. I have some doubles of some of these cards for those interested. Monty EX/NM, Kelly Ex/NM OC, Hinkle PSA 6, Burnett PSA 3, Isola PSA 2 and a bunch of others. I had thought about it myself. just picked this up.. 1959 Packer Team Card...7 more to finish the set. Still not sure how I feel about this pick up. On one hand, Tosi is real tough, the card has good eye appeal, and the price was reasonable. However, the hole does bug me. I guess I can use this as a filler and look to upgrade in the future. While on the topic of this card, I understand it's rare since it's a high number, but the price seem really high. When I looked at the pop reports (PSA, SGC and BGS) a year or so ago, it was the rarest, but not by much - maybe 2-3 less graded than Kostka and only 10-15 less than the other high numbers. Also, it's not like Tosi was a HOF type player. Any insight on why this card has a premium? eBay purchase 1965 Philadelphia #81 Bart Starr completed my set! Congrats on completing the set! What is the next project? eBay purchase arrives today 1955 Bowman Tom Landry completes my set! You are marching through these sets now, Larry! Congrats. Also in the mail today via eBay pickups: Three hits 1963 Fleer, and it looks like I still need 29 more cards to complete. This set is pretty difficult, and I'm lucky to find hits for less than $5 each! Finally a '62 Topps Roman Gabriel (short print) RC FINALLY won an auction for this card! Thanks Ray, two more to go! Nice high numbered Chicle! What are the last two? 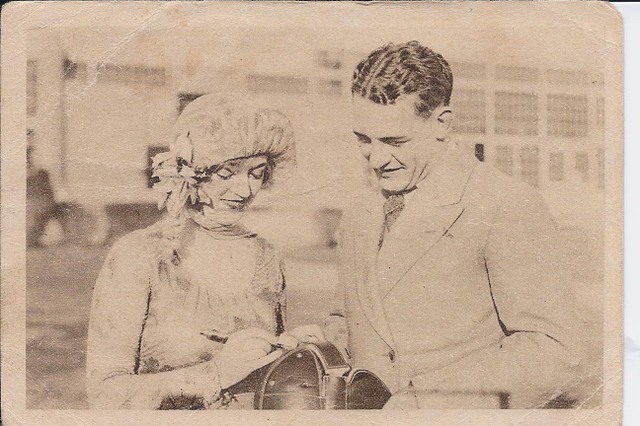 Isola and Nagurski. Looking to stay in the PSA 1-2 range. Nice pickups, all! It's great to see iconic sets like Chicles, 63 Fleers, Bowmans, etc. being completed by members. Awesome job, everybody! Those are great sets. Picked up these three earlier this week. All 1964's. Last edited by sb1; 06-04-2015 at 08:48 PM. Great pick-ups everyone - really like those Fairmont Dairy cards! I need the Isola as well - don't see a lot of those. I think you have to watch all the auction houses for Nags - not many sell in 99 cent eBay auctions even in low grades.... Keep us posted. You didnt like that Nag beater i mentioned last month. I bidded on it, just to have one that was presentable. Last edited by pawpawdiv9; 06-05-2015 at 05:17 PM. I completely missed it. That is the type of Nagurski I'd be looking for. Just returned home from our local monthly show. I picked up four hits to my 1950 Bowman set, one hit to my 1952 Bowman Small set, and this hit to my 1952 Bowman Large set: #46 Art Donovan RC (SP) except for the writing on the front of the card, it's a beauty! That '59 Topps Bart Starr is really nice!